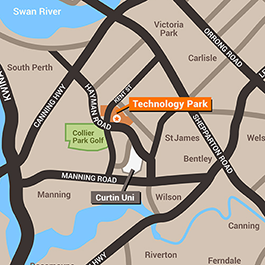 Located 23 km south of Perth and adjacent the coastal facilities of the Australian Marine Complex (AMC), Henderson, is Western Australia’s most recent technology park development, Marine Industry Technology Park, Munster. One of two technology parks, the Marine Industry Technology Park is dedicated to fostering enterprises involved in specific technological development, training and education associated with ship design, building, repair and marine engineering. The Park includes dedicated retail units for lease. For opportunities, contact Graeme Perry at Burgess Rawson on +61 8 9288 0249. The AMC Jakovich Centre is a large modern facility located in the Marine Industry Technology Park. The Centre features a range of spacious meeting rooms fitted with state-of-the-art equipment, and is available for all events ranging from small groups and business meetings to large celebrations for up to 250 people. For more information about the Jakovich Centre click here.